Hand-coloured etching created by Thomas Rowlandson and published on 1st September 1811 by Thomas Tegg. An enormously tall, strapping young courtesan, winking broadly, places a ladder against her chest for a diminutive, elderly, leering marine officer to climb up to her. A version of Admiral Nelson's famous signal before the Battle of Trafalgar in 1805, "England expects that every man will do his duty", appears on the ribbons of the woman's hat. That quotation is used here in a sexual context as opposed to that of a heroic naval battle. The woman's waistband makes a reference to HMS Bellepheron which took part in the Battle of Trafalgar and to whose captain, Napoleon later surrendered in 1815. The marine officer's sash is inscribed Death or Victory. The canon and cannonballs situated on either side of the couple are also a visual innuendo and in the background are moored naval ships. 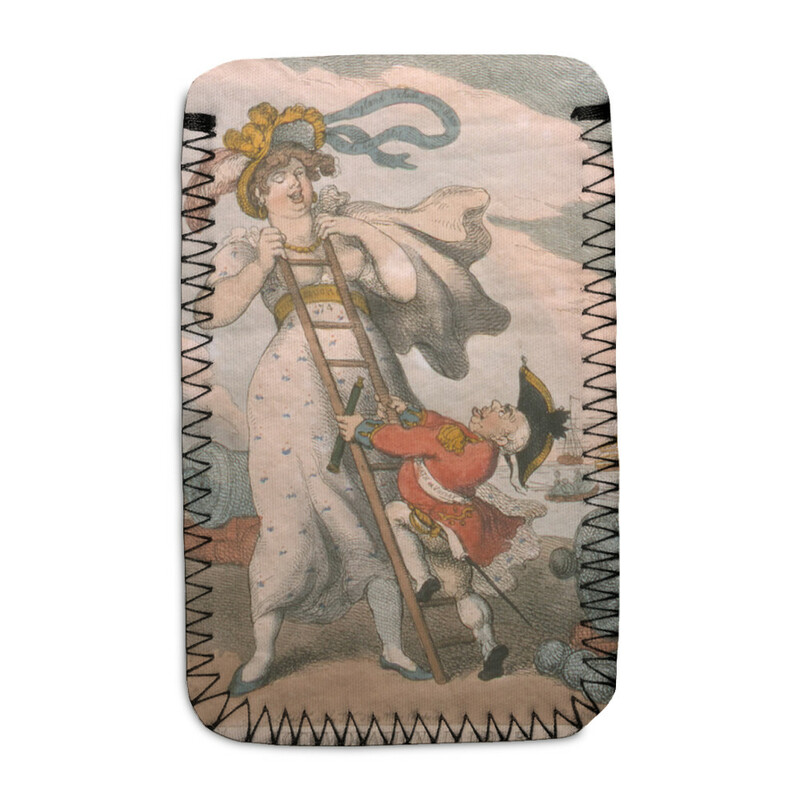 This print makes fun of the idea of a physical relationship between a diminutive man and a huge woman, punning on the phrase "accommodation ladder" which means a ladder up the side of a ship from a small boat. The most famous short man in Europe at this time was of course Napoleon. This Accomodation Ladder Phone Sock is created using state of the art, industry leading Digital printers. The result - a stunning reproduction at an affordable price.